Art Nouveau’s main ingredients were the Symbolists, who believed that art should reflect the truth indirectly as if in a dream; the flat perspective and strong colors of Japanese wood block prints; and Japanese organic forms and representations of nature. Out came the curvilinear forms of Art Nouveau, which lasted only 20 years (1890-1910). In different countries, the movement had different names. Jugendstil in Germany, Stile Liberty in Italy, Arte Joven in Spain, and Modernisme in Catalonia. The pioneer of Modernisme in Catalonia was Lluís Masriera. In Geneva, he studied enamelwork with Frank-Édouard Lossier. 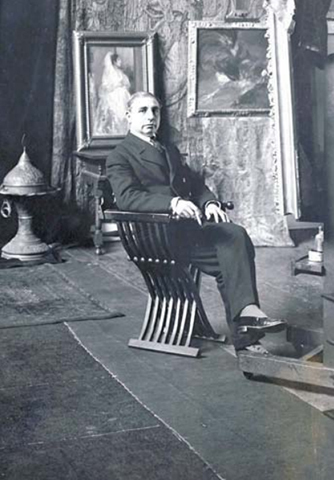 On his second visit to Paris in 1900, he attended the Exposition Universelle and saw the jewels of Lalique. 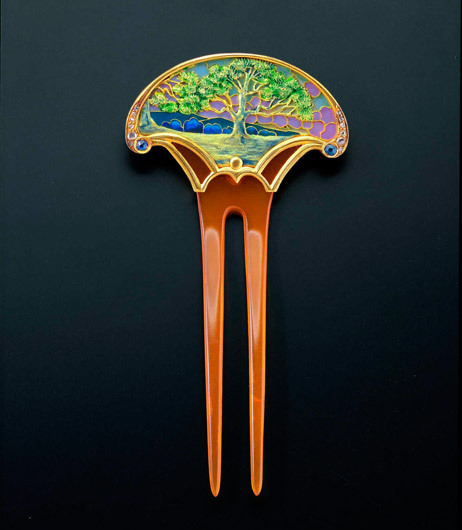 Lalique’s technical skills in plique-à-jour and basse-taille enameling, and the way his jewelry integrated engineering and design into a Symbolist idea, were an epiphany for Masriera. Exposition Universelle de 1900, Paris. 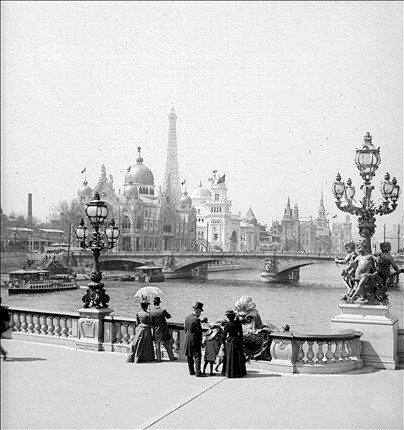 Les lampadaires du pont Alexandre-III et la rue des Nations. Upon returning to Barcelona, he closed his shop, melted down all his stock, and started again. 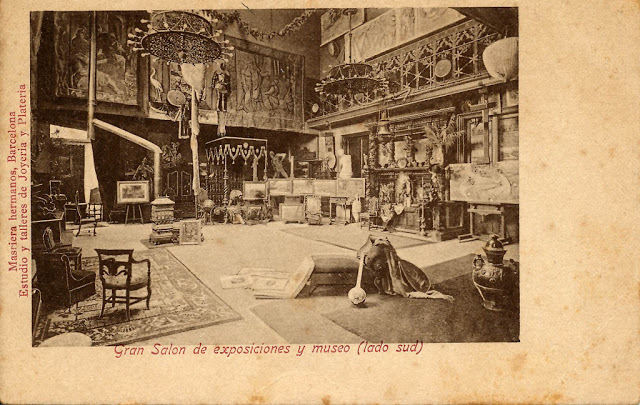 Opening a week before Christmas in 1901, the designs at Masriera Hermanos, 35 Carrer de Ferran, were ready. The shelves were empty within a week. Masriera became world famous. He was even commissioned to make a tiara for Queen Victoria Eugenia of Spain in 1906 as a wedding gift from the people of Catalonia. It is called the tiara desaparecido, as no one knows where it is. The tiara was made of diamonds and pearls in a gold frame with multi-color plique-a-jour enamel. On the bottom are two fleurs-de-lys, symbolizing the House of Bourbon. Continuing the heraldic theme, a horse forcené is placed next to each fleur on the band. Between the band and the tiara’s top gallery is the flag of Catalonia. 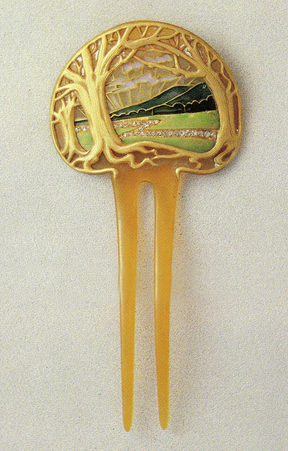 and this comb at the Schmuckmuseum in Pforzheim, which also depicts a landscape scene. It is made of gold, tortoiseshell, diamonds, sapphires, and enamel. Another comb from this period was shown at the Van Gogh Museum’s “Barcelona 1900” exhibit in Amsterdam, which ran from September 2007 to January 2008. 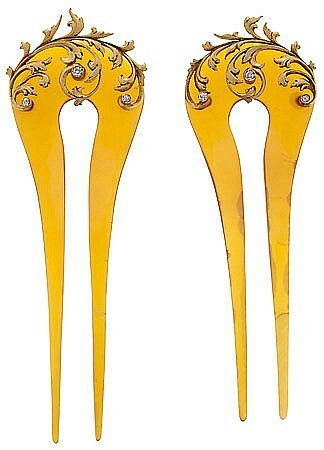 This pair of blonde tortoiseshell hair pins with sculpted gold and diamond decoration were attributed to Masriera, c. 1902. They sold for €1,500 in Barcelona, 2012. 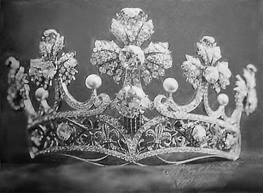 Lluís Masriera made only two tiaras. 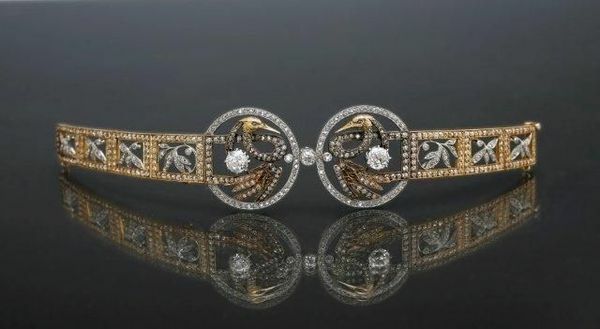 In this one, c. 1901-1910, he used yellow gold and platinum, set with 513 old-cut diamond brilliants, which had an approximate total weight of 12,5 carats. 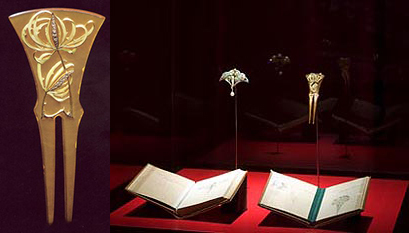 The wings of the birds were decorated with plique-à-jour enamel and set with two important diamonds of approximately 1.20 carats each. The piece is in the possession of Aardewerk jewelers, with certificate of authenticity by Bagués-Masriera, and registered in the workshops book no 2 and under reference nr 1336.